Stress is one of the most common ailments in today’s super chaotic life. The discovery of stress is dated back to 1950 when endocrinologist ‘Hans Selye’ first identified and documented stress. Stress can have a direct effect on your work performance, relationships, emotions, and thoughts. You may get irritable easily and could even lash out at the slightest provocation. Let's share with you few simple yoga poses that may help you reduce the stress you are encountering. Popularly known as ‘Savasana’, gets its name from the recumbent posture of a dead body. This is a position of rest and relaxation and is usually performed at the end of the yoga session. This posture brings deep, meditative state of rest and helps in relieving stress. It also helps in reducing blood pressure, insomnia and anxiety. One can also practice this pose if you are extremely tired and needs to rejuvenate. When you do this practice on regular basis, it conditions the body to release stress and helps in improving your sense of physical and emotional well-being. Caution – This asana is absolutely safe and can be practiced by anyone unless your doctor has advised you not to lay straight on your back. 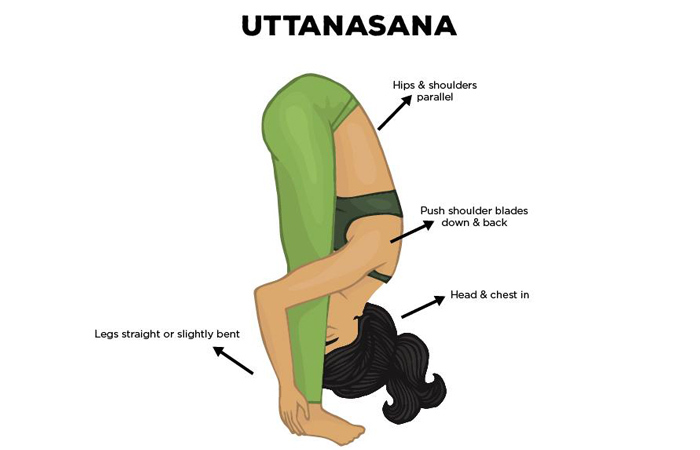 Popularly known as Uttanasana, (OOT-tan-AHS-ahna) ut = intense tan = to stretch or extend, it helps you awake your hamstrings and soothe your mind. It is one of the easiest yoga postures to release stress and anxiety. In this pose your head is below your heart and thus allows the unusual occasion for blood to rush to your head (rather than your feet), giving your cells a rush of oxygen. It helps to calm your mind and combat mild depression. This incredibly beneficial posture is both therapeutic and revitalizing. Caution: Avoid this asana if you have a lower back injury, sciatica, glaucoma or a detached retina. The cat stretch known as ‘Marjariasana’ brings out the excellent feline stretch in the yoga workout. The word ‘Marjariasana’ comes from Marjari = Cat; Asana = Posture or Pose. This pose calms by soothing and stretching the lower back, relieving stress and massaging the spine. It tones the abdomen, improves digestion, improves blood circulation and relaxes the mind. Marjariasana reduces stress by calming the mind which is why it is one of the best yoga postures for beginners. Caution: Consult your doctor before doing this pose if you have back or neck-related problems. The Bridge Pose known as ‘Setu Bandhasana’ calms your stress by giving little stretching of the back and legs. 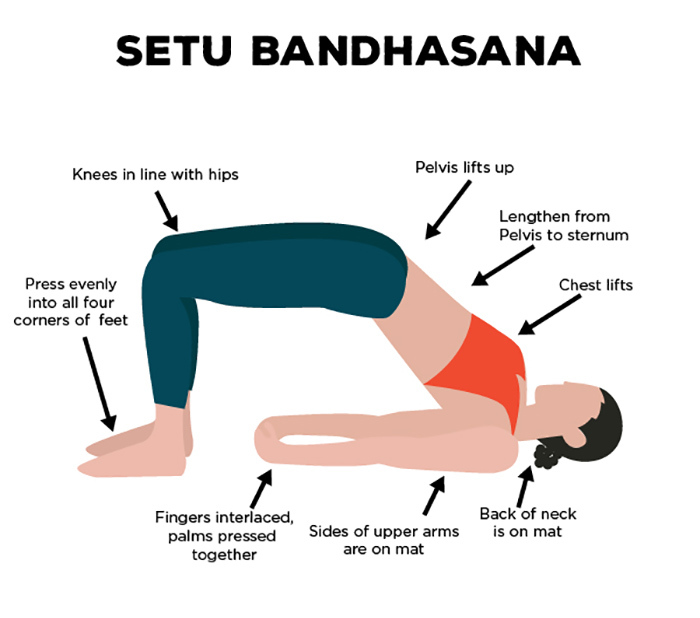 The name ‘Setu Bandhasana’ comes from Setu – Bridge; Bandha – Bind, Lock; Asana – Pose and the posture resembles a bridge hence the name. This asana is great for combating anxiety, headaches, insomnia, fatigue, and backaches. True Yogis claims that this is the most versatile backbend posture one can practice in a variety of ways. This asana must be done when your bowels and stomach are absolutely empty. Caution: Consult your doctor if you are suffering from a neck injury or if you are pregnant.